Self-Help for the Elderly holds many events during the year. They wouldn’t happen without our volunteers and staff members, they wouldn’t happen. Learn more about how you can get involved by volunteering, joining our staff, or donating. Self-Help for the Elderly holds various programs throughout the year and asks for volunteers to make them possible. If you are looking for a way to help out, see if volunteering is right for you! In 2011, for Self-Help for the Elderly’s 45th Anniversary, a "Legacy Tree Campaign" was launched. 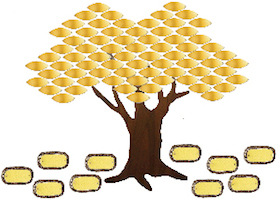 Each three-dimensional bronze tree has names engraved into a leaf to honor donors or remember loved ones.